So, in the spirit of full disclosure, as I type this I am sitting on a balcony in New Zealand with a lovely, crisp glass of Sauvingon Blanc next to me. Marcus and I are visiting our dear friends, Tyler and Manders, and are on holidays currently in Nelson, New Zealand. We haven’t met up with our friends yet, instead doing a bit of exploring on our own. And it is not very often that Marcus declares something the best of something he’s ever had, ever. What happened is this. Last night, after a long drive of getting ourselves to Nelson, which includes a farmers field (another story altogether), I looked up great restaurants online and decided we must go to this particular restaurant, Hopgood’s. It was a bit too early in the evening for a meal, so we tucked ourselves in for a good beer until dinner time. Marcus ordered potato wedges. No longer hungry. End of story. I then made him run across the street to the restaurant I wanted to try, to make reservations for the next evening, which was tonight. We went to Hopgood’s tonight. And it compares to everything great in Marcus’ culinary scale: Nicolai’s on Santorini, Greece. I heard many, many time tonight, “this is better than __, or I like this just as much, or even more than __”. It is that good. Sooo good. We had bread (of course, my blood runs Campbell). We had crab cakes. Marcus had duck. I had lamb. And in a shocking twist to anyone who knows Marcus, he has chocolate mousse. We then managed to roll ourselves back to the hotel. On reflecting on my delicious meal tonight, the only thing that justifies being shared, the only thing I can think of that is just as truly satisfying, is this frittata from the Smitten Kitchen Cookbook. I make this, or a version of this, at least twice a month. Marcus loves it, I love it, guests love it. A winner. 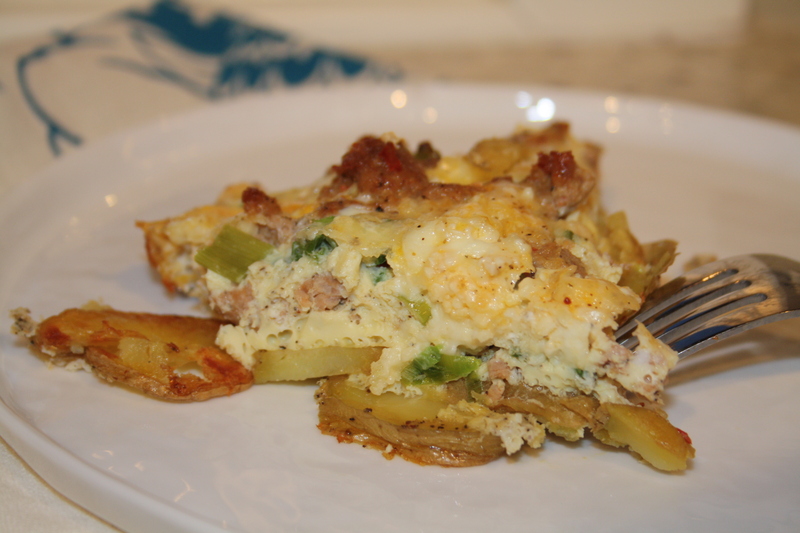 When I lived up north, I used to make a frittata recipe made in muffin tins with leftover, plain pasta. It was fantastic for the single gal – easily made leftovers and adaptable to whatever is in the fridge. Being a big fan of Smitten Kitchen, I made Deb’s frittata out of her cookbook on a whim when we were having brunch guests a few years ago. It was – is – yuuuum!! Such a hit. So easy. An easy addition to the dinner repertoire. Frittatas, essentially quiche sans crust, can be made out of anything you have going on in the fridge. 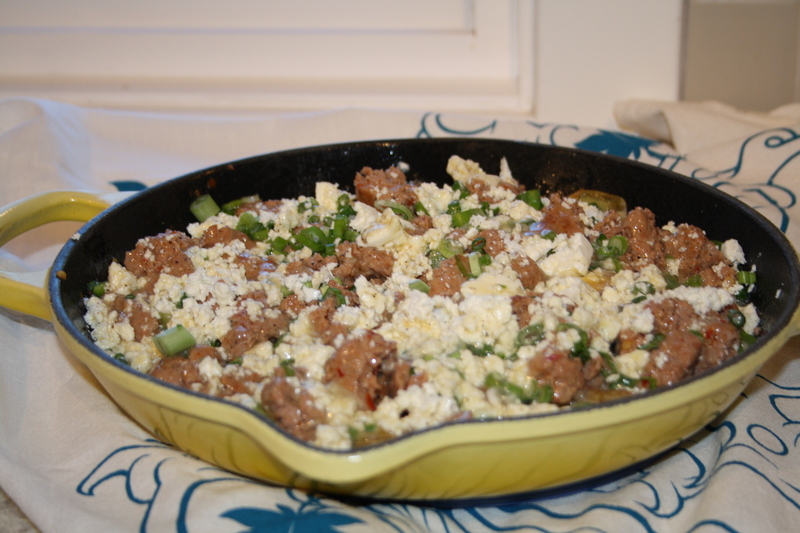 Here, we do it with potatoes and green onion and sausage and feta. Old pasta, or another cheese, or any veg would be just as good. Just watch the saltiness of the cheese you use. 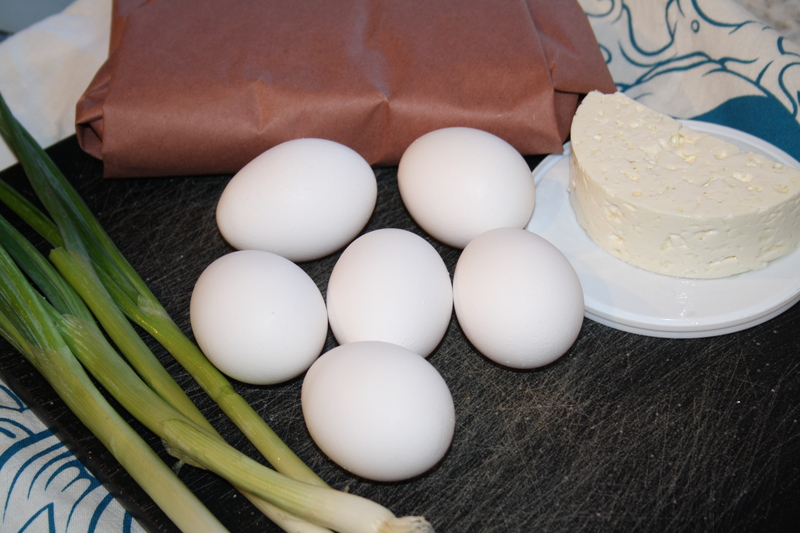 With a brined cheese like feta, limit or omit your addition of salt. I always find when I make this, I question the amount of green onion. Don’t. You will want every, delicious piece of freshness and savouriness. Each component, layered together, basically creates a flavour bomb so that each bites is salty and creamy and fresh. 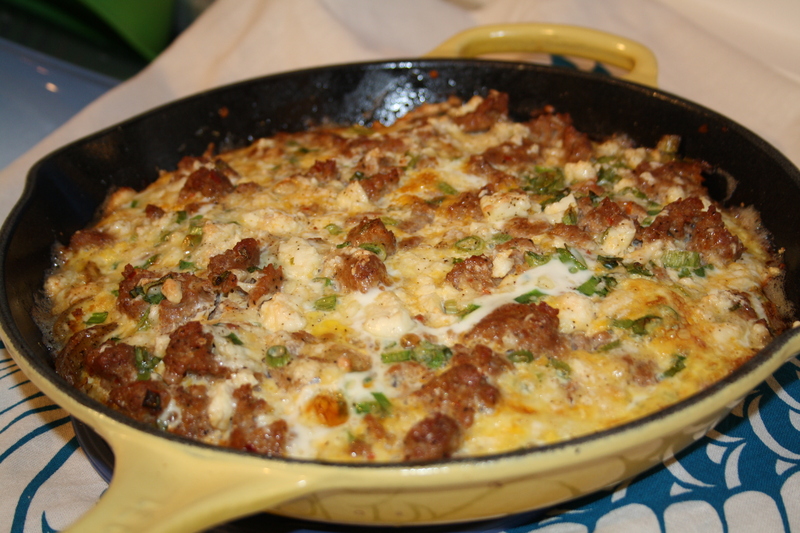 Paired with a light salad, this frittata makes a wonderful dinner. I have made this for Marcus and I, for breakfast and dinner, more times than I can count on my fingers and toes. I have also made this for brunch guests, and guests just arriving in town and hungry from a plane ride and long journey. It is packed with flavour. You can make the individual components in advanced, and then feel like Martha once it all comes together, and it is easy. Everyone likes eggs and some deliciousness added in. Make this, and feel like a superstar. We’re going to cook the potatoes first. Preheat your oven to 400 degrees. Cover a baking sheet with foil, then spray with nonstick cooking spray. 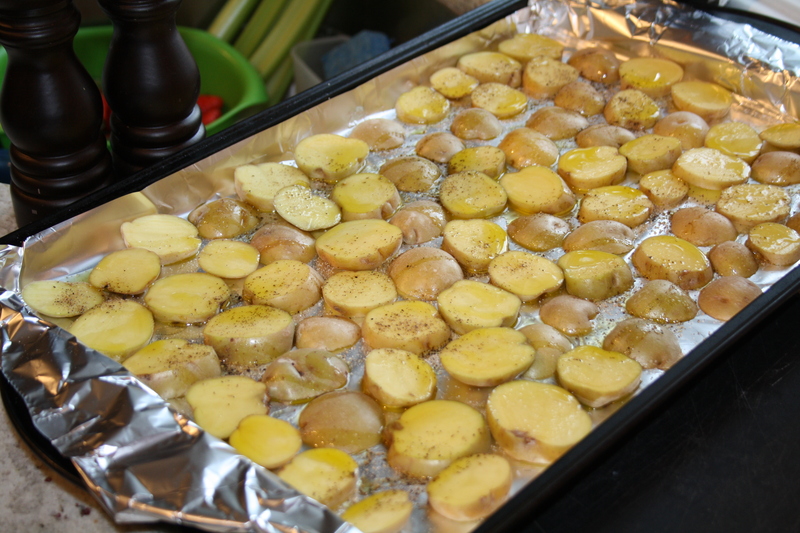 Place your sliced potatoes in a single layer on the baking sheet. 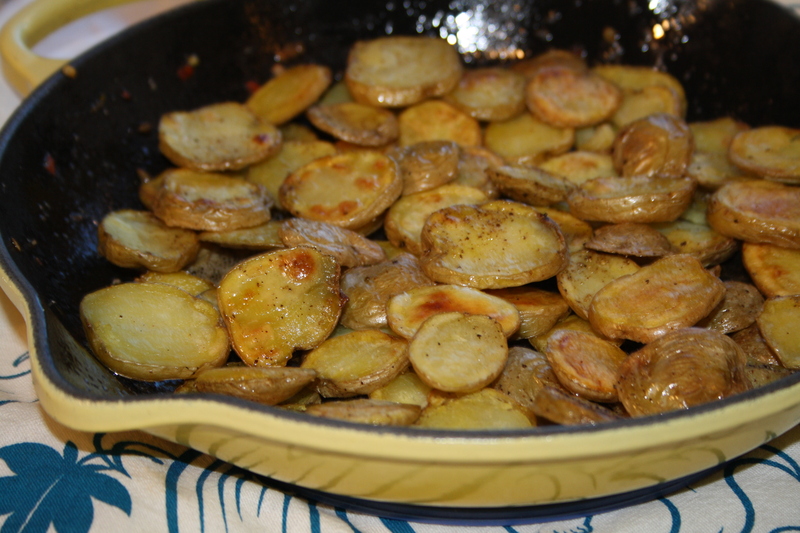 Sprinkle salt and pepper over the potatoes so that each gets a little seasoning. Roast for 35 minutes, tossing halfway through, until potatoes are golden and slightly crispy. 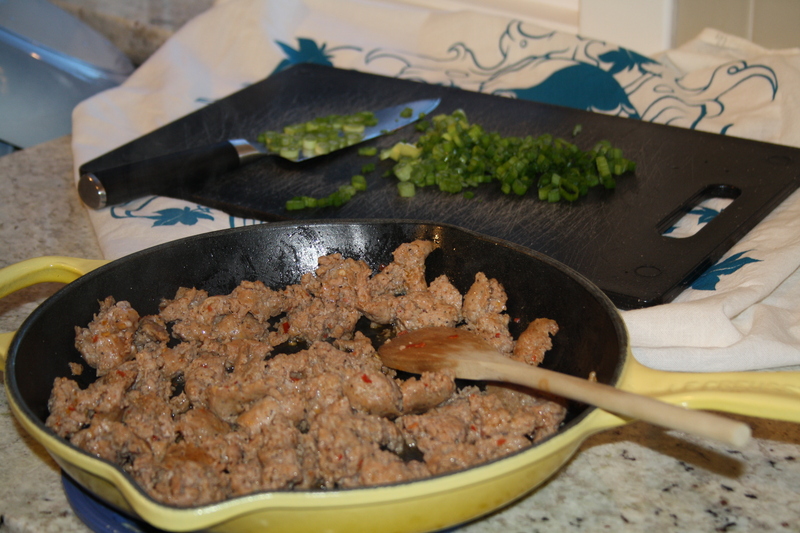 Remove the sausage from it’s casings and cook over medium heat in a 9 inch cast iron skillet. Breaking it up as you go along, the sausage will be cooked after about 8 minutes. Remove the sausage from the skillet but keep the grease in the pan. If the it’s a lean sausage and there isn’t much grease, give the skillet a little spray with the nonstick cooking spray especially on the sides. We’re going to arrange the frittata by first placing the roasted potatoes at the bottom of the skillet. Next, add the sausage so each potato has some on it, then scatter the green onions and feta over the sausage. 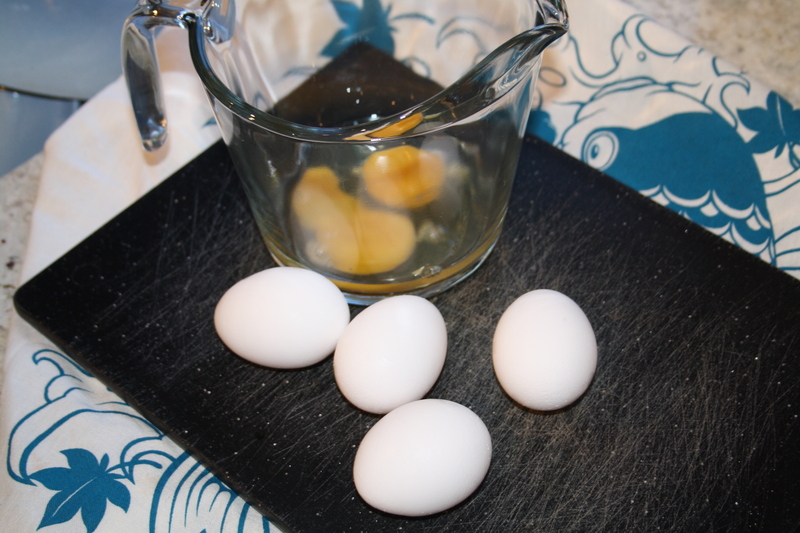 In a small bowl, whisk the eggs with the milk and 1/2 tsp black pepper. Pour the egg mixture over the goodies in the skillet, then cover with foil. Bake in your already-hot, 400 degree oven, for 20 minutes; then remove foil and bake another 15 minutes. You’re looking for a puffed frittata that’s golden and set in the centre. Serve in wedges hot, warm, or cold, right out of the skillet.